The question which seemed to dominate a lot of Manchester United fans’ minds after the draw to Bournemouth this past weekend. Here was the perfect opportunity to move up from sixth place in the table but United couldn’t deliver. This isn’t the first time Manchester United has encountered drawing at home when a win is needed, and it might not be the last. A look into where it went south for Manchester United and how Bournemouth regained their confidence and poise in the second half. Images below indicate both teams’ general movements in possession. It seems under Jose Mourinho in a 4-2-3-1, there’s not a need for the two centre mids to interact as a duo (playing off of each other up and down the pitch). Michael Carrick and Paul Pogba would often be positioned on opposite sides of the pitch during Manchester United’s build up phase. Although, they did share 26 passes (13 each) between each other throughout the match. These moments seemed more due to lack of vertical passing options than playing off of each other as a way to move up the pitch. Instead, their purpose seemed more directed to helping United progress up the pitch in their respective areas or zones. Between Marcos Rojo, Luke Shaw and Anthony Martial, Pogba had 30 pass combinations (10 each) to them, demonstrating he was tasked with helping United progress on the left side of the pitch. Shaw played 15 passes to Martial as he looked to combine with the Frenchman in order to break down Bournemouth on the left. To make space for Antonio Valencia, Juan Mata would drift in towards the middle and look to combine with his teammates as an attempt to unlock Bournemouth’s defence. Wayne Rooney was allowed to roam around and move up close to Zlatan Ibrahimovic with the same goal in mind (unlocking Bournemouth’s defence). However, there were times Rooney got too close to Zlatan and didn’t move into space to make himself a passing option. In terms of attacking cohesion, Manchester United’s Henrikh Mkhitaryan was a big miss. Unlike the other players, he’s able to support the build up play from midfield into the attacking third, which allows United to fluidly attack more consistently. However, his presence wasn’t required to break down Bournemouth’s defensive organisation as United created enough chances to win the game (15 total, 9 first half, 6 second half to Bournemouth’s 1). Similar to Manchester United, Bournemouth’s build up structures weren’t anything sophisticated. Their main strategies were breaking down Manchester United’s defence via mainly ground passes to the wings, either in build-up phase or in transition; combining on the wing (sometimes with overloads) to free up space in the center to find passes to the forwards (Benik Afobe and Josh King). The midfielders, Harry Arter and Andrew Surman, and left back Charlie Daniels were mostly responsible for implementing either strategy as Bournemouth’s right back, Adam Smith, didn’t move much into advanced positions on the wing. Bournemouth attacked the wings partially due to Manchester United’s passive pressing, which transpired in several ways. Passive pressing differs from more active pressing actions in terms of whether or not the team counterpresses in defensive transition. If you aren’t familiar with counterpressing or gegenpressing as it’s referred to in Germany, the main idea is immediate ball recovery through pressing the opponent as a unit right after losing possession. While there were instances which could appear as Manchester United counterpressing against Bournemouth, the pressing actions usually involved one or two players. The rest of the team sat deeper or remained in position, reading the play to determine what to do next. Defensively, Jose Mourinho wants to limit the opposition gaining access into central areas. As Bournemouth progress up the pitch, some gaps appear as Pogba and Carrick are advanced. Martial retreats to occupy one of these gaps, serving two purposes. First, closing down access to central areas, directing Bournemouth to shift their build up wide. Secondly, slowing down Bournemouth’s ability to move upfield giving time for Pogba and Carrick to recover. Perhaps, this is the kind of team-oriented work Mourinho wanted to see from Martial. In Manchester United’s passive pressing scheme, the trigger is the ball receiver (Ryan Fraser in this case). Due to Martial retreating into one of the gaps, he can now apply pressure directing Fraser to the wing. If he wasn’t there but remained in an advanced position, it would be easier for Fraser to dribble vertically towards United’s goal. Pogba backward presses (pressing toward your own goal) Fraser and makes a successful tackle which leads to United recovering the ball. After United recover the ball, Carrick attempts a pass to Martial. Instead of playing to feet, Carrick plays into space which allows Fraser to challenge for the ball, leading to a ball recovery (winning the ball). The yellow circle indicates another gap in Manchester United’s defence. The next image demonstrates how Rooney seeks to help United close this gap through pressing the ball receiver instead of retreating into space. Rooney’s pressure limits Arter’s time on the ball and space to operate. Since the pressure is coming from Arter’s blind side (outside of his field of vision or blind spot), it acts as an element of surprise, further reducing the available time Arter has to make a decision. More press-resistant midfielders such as Busquets, Xavi, Modric, etc. scan (head on a swivel) their surroundings multiple times before they receive the ball. Arter only does it once when Rooney has already begun to press him. A case of too little, too late. As a result, Arter is forced to make a quick decision and decides the best option is passing to Surman. If Rooney didn’t decide to press Arter, Arter would have had more time and space to pick other options. He could have passed to King who made a subtle movement behind Carrick as Carrick stepped up to limit Arter’s passing option to King. 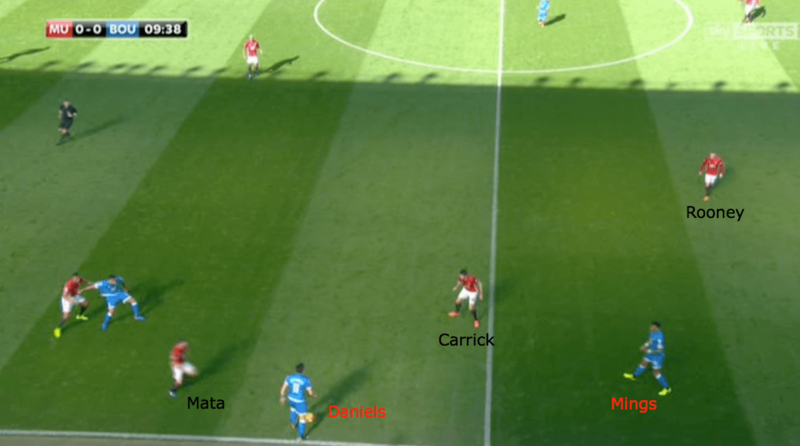 He would have the time and space to turn and dribble towards one of the gaps in midfield (to the right side of Carrick in picture above), leaving Manchester United’s backline exposed without midfield protection. 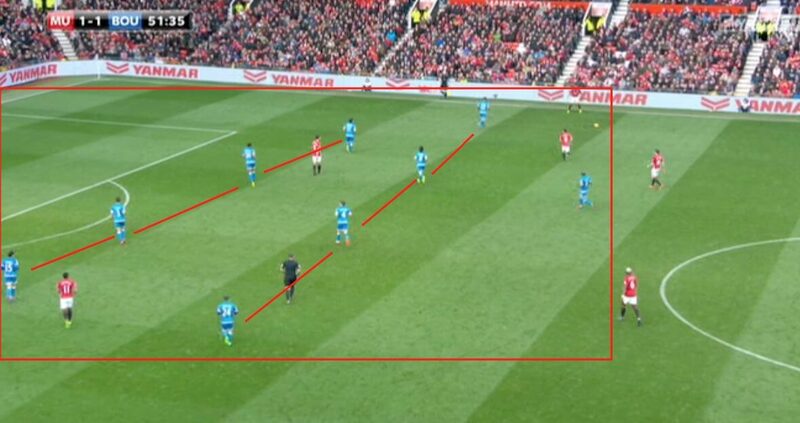 Mourinho’s understanding of zonal defending is passive. Manchester United’s passive pressing highlights how Jose wants to limit the opponent creating clear cut chances. This objective is achieved by pressing the ball receiver in certain moments, closing central spaces, and forcing turnovers, leading to counterattacking opportunities. If Mourinho wished for a more active pressing scheme, it would look similar to a pressing scheme Pep Guardiola is known for using called passing lane-oriented counterpresing. From the offset, Manchester United started the match strongly. Within the first couple minutes, the Red Devils troubled Bournemouth and created a chance to score. Valencia exemplifies how Mourinho’s passive pressing scheme is supposed to work when he presses Pugh on his blind side. Pugh isn’t able to prepare for Valencia’s challenge as he receives the ball. As a result, Valencia recovers the ball and finds Rooney for headed shot towards goal. The United players demonstrated a clear understanding of Mourinho’s passive pressing scheme in the early stages. As Daniels tries to assess his next decision, Mata begins to press him from his periphery. The angle of Mata’s press pushes Daniels back towards his own goal with his nearest passing option being Tyrone Mings. Since Carrick is closest United player to Mings, when Daniels attempts to pass to Mings, under Mourinho’s passive pressing scheme, he would be tasked with pressing Mings since he’s set to be the ball receiver. The following images show Carrick doing exactly that. Its result leads to Mings playing an inaccurate backpass which Rooney intercepts and plays to Zlatan for a chance on goal which he unfortunately does not shoot first time. Bournemouth clears the ball after Zlatan tries to recover not shooting first time by crossing in the box. As Steve Cook receives the pass, Zlatan decides to get in on the pressing action too. The timing, angle, and closing speed of Zlatan’s press reduces Cook’s ability to make an optimal decision. Cook decides the best thing to do is dribble diagonally away from Zlatan, but the Swede doesn’t give up. 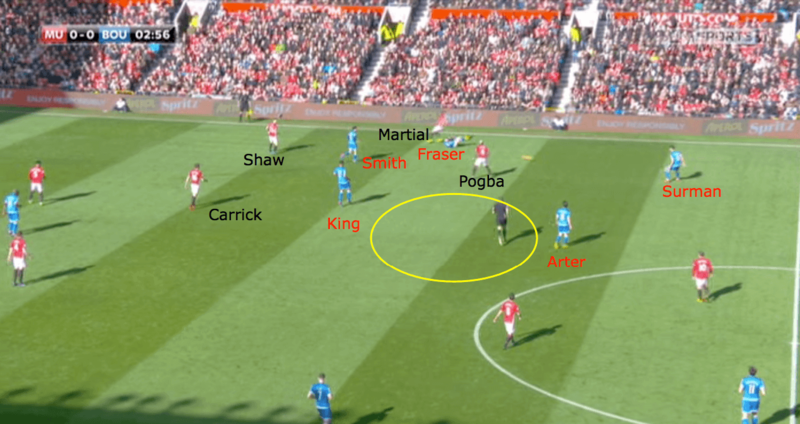 Along with Zlatan’s direct pressure on Cook, Shaw, Martial and Carrick contribute to the penned in effect Cook encounters with Fraser as his only passing option. Martial’s position cover shadows Smith, who is behind him. Cover shadowing is a method in zonal defending geared towards preventing a pass by a player (Martial in this case) positioning himself between the ball carrier and an open man (Smith in this case). Shaw’s position limits Cook from advancing forward and Fraser running forward into space, thus Fraser checks back into space to try and help out Cook. Carrick’s positioning cuts out any passing lane into central spaces. 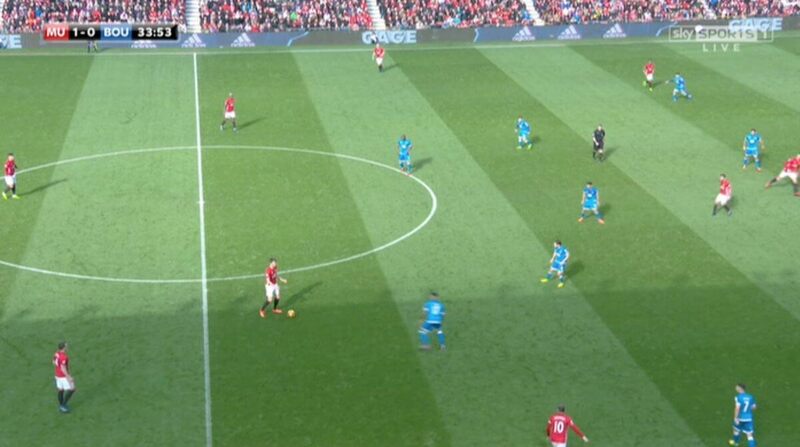 A classic example of United waiting for the opponent to make a mistake through Mourinho’s passive pressing scheme. Due to Zlatan’s initial pressure, Cook dribbles into a blind alley and now has little help to escape the situation. Cook lays off the ball to Fraser, Zlatan then shifts to press Fraser (ball receiver), then Fraser passes back to Cook to try and evade Zlatan’s press. Shaw reads the play quickly and steps up to intercept the pass where the ball finds its way to Zlatan, forcing a turnover and leading to a counterattack for Manchester United. Even though Cook is out of position, Surman drops into the space Cook vacated. Daniels and Arter retreat as Mata makes a run towards goal. Through collapsing the space around Mata, Bournemouth are more easily able to cut out Martial’s pass to Mata, nullifying the threat of the counterattack. A strategy Bournemouth used more often in the second half after going down to ten men. While passive pressing scheme certainly has its advantages, it also has its disadvantages. It’s arguably not as risky as passing lane-oriented counterpressing shown above, though its pitfalls are similar. At the highest level, timing is everything and there are many instances where passages of play could have gone either way due to fine margins. One example is when a defender is late to join the rest of backline in an offside trap, giving an attacker the opportunity to score without being offsides. The same idea follows in pressing. Whether the pressing scheme is more individualistic or a cohesive framework, it will have an impact on how the game subsequently flows. One main disadvantage with Manchester United’s passive pressing scheme, is if any player pressing the ball receiver is late and is unable to slow down the opponent’s build up or force a turnover, it leaves space in behind for the opponent to exploit. In the English Football League Cup final against Southampton, Manchester United ran into this issue on several occasions, especially from their midfielders Pogba and Ander Herrera. Against Bournemouth, it led to the penalty where the Cherries (Bournemouth’s nickname) equalized. As Valencia attempts to press Pugh (ball receiver) to force a turnover or slow down Bournemouth’s build up, the away side are able to retain possession and keep play flowing at a steady rhythm due to Valencia’s late timing. Instead of dropping back, Valencia pushes even higher, engaging Arter meaning he is further out of position. Mata wouldn’t be considered engaged in the play as he is just marking space. He could be more involved if he decided to fill the space Valencia left behind, but based on speed of play at this stage, it might be too late to recover the situation. As a result of Valencia stepping high, Phil Jones attempts to cover his area and Valencia’s. Jones attempting to cover multiple areas leads to more separation between himself and Rojo. 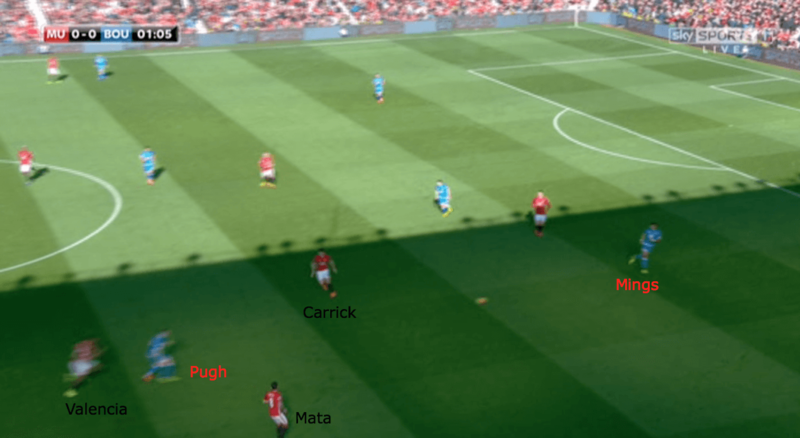 Combined with the separation of Pogba and Carrick (black lines shown above), it allows for Marc Pugh and Afobe to find more space between the lines. Since there is more space for United to defend, Jones and Rojo have more information to take into account. Ultimately, these type of breakdowns make it difficult for central defenders to not make mistakes as any moment of hesitation can work against them. It further highlights the importance of midfield protection and remaining compact, unless the defensive strategy is to trick the opponent into thinking there’s space when it’s actually a pressing trap. Since Rooney is late to press Surman, Surman has the opportunity to find Afobe which creates a 3 v 2 situation with Afobe, Pugh, and King versus Jones and Rojo (shown more clearly in next picture). Pogba and Carrick’s separation gives Afobe slight temporal advantage to turn and vertically attack the space in behind United’s midfield. Due to the separation and space between Jones and Rojo, King sees an opportunity to run into the space between them. Jones senses danger in both Afobe receiving the ball and King attempting to run in behind, thus retreats towards gap between himself and Rojo. As a result, this opens more space for Pugh to receive a pass from Afobe. The image above more clearly highlights the 3 v 2 situation between Afobe, King, Pugh and Jones, Rojo. Jones now realises checking into the gap between himself and Rojo allows Pugh the opportunity to receive a pass from Afobe and is caught flat footed. Pugh then has more time to receive the ball and set himself before being tackled by Jones for the penalty. 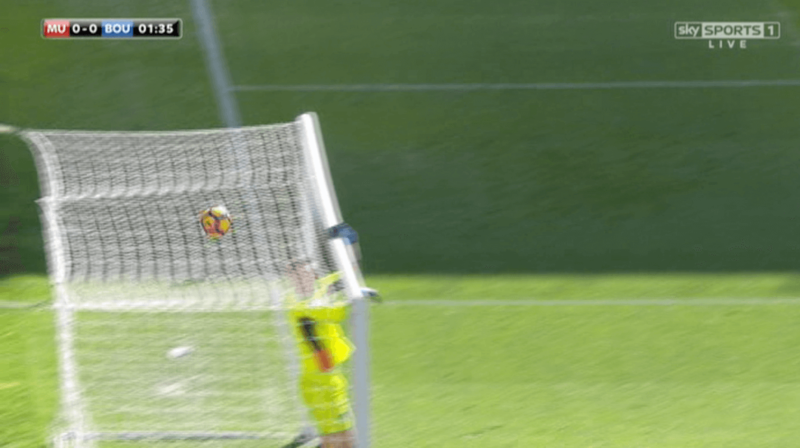 While Manchester United fans may heavily criticise Jones for giving up the penalty, the circumstances were unfavorable based on the reasons previously mentioned. Considering it was also his first game back in some time, makes sense he would be lacking a bit in match sharpness. Overall, a great move for Bournemouth to bring themselves level and a collection of errors for Manchester United to hopefully rectify in the future. As summarised in the previous section, Manchester United’s passive pressing scheme serves an attacking purpose of creating chances through turnovers and quickly counterattacking into open space. United create most of their opportunities and big chances through turnovers which speaks to the effectiveness of the approach and lack of shot conversion in these moments. United punish themselves for not converting the high quality chances they create. Unfortunately, the other pathways United look to create don’t yield as much success. Since Mourinho gives the players more free reign in attack, it means there’s higher possibility of uncoordinated movement, uneven spatial occupation (how players are spaced out across middle/attacking third), limited passing triangles, and improvised attacks. None of these are bad per se, used well, they can work to destabilise the opponent, however since it’s more free form, it also can reduce the level of repeatability in destabilising the opponent. Players work together to try and create certain scenarios which benefit the way they like to attack. With football being such a dynamic sport, there’s no guarantee in recreating certain scenarios in an organised attacking structure let alone a free form/flexible one. Therefore, without certain personnel in the team, it can be difficult in a free form attacking structure to maintain a stable rhythm and flow when facing up to more stubborn opposition. When the space is there to operate, it’s easier for players to find combinations and play through their opponent. When it’s not, it can be difficult for players to find a solution without some guidance. Hence, a sound attacking structure with an organised gameplan (ie Pep Guardiola’s Juego de Posicion) can help players navigate situations and find solutions they may have otherwise found troublesome. Additionally, it’s easier to tweak the attacking structure when there’s an organised gameplan versus a free form structure which more heavily relies on the personnel. Thus, the best a manager can do here is either change the attacking formation or change personnel. As a result, Manchester United’s pathways in attack other than counterattacks via passive pressing are off the ball movement, local combinations (combining with players closest to you), passing between the lines into central spaces, and balls over the top. All of these pathways’ effectiveness depend more on the individual quality of the players involved than the cohesiveness of the attacking structure. A superiority known as qualitative superiority (superiority achieved through one’s own quality). Under Mourinho, any player in the 10 position is allowed to roam and assist teammates in constructing build up and advancing play. Ideally, you have a player who is comfortable playing occasionally in tight spaces, but also adept in finding space with off the ball movement compatible with teammates’ positioning and flow of the game. While Rooney is a faded force, his movement off the ball is still quite good. In any case where the opponent likes to man mark (whether man-orientations in zonal scheme or other forms of man-marking), Rooney’s presence and movement can drag his marker with him opening up space for others. 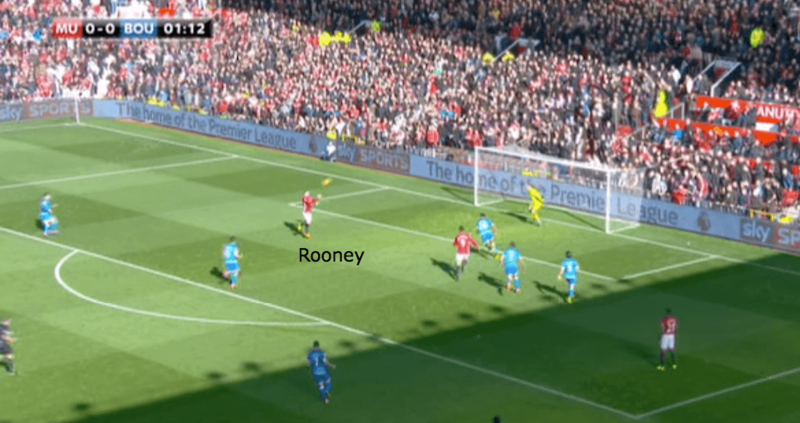 The set of pictures below demonstrate how Rooney opens space for others and the play results in a corner for United. It may not seem like much but subtle movements can spell the difference between an attack continuing to flow or petering out. Daniels (Bournemouth left back) follows Rooney’s checked run into space which opens up space for Valencia. As Valencia seeks to dribble down the wing, Bournemouth’s midfield line is still rotating to near side wing which leaves Valencia with more space to run into. Since teams tend to try and lock down access to central spaces, it can take some effort in destabilising their defensive structure. One way of achieving this is through local combinations, defined earlier as combinations with players closest to you. If a team is content in showing the attacking team wide, the attacking can use local combinations (sometimes with overloads, overlapping or underlapping), as a way to penetrate down the wing or open up spaces to attack in other areas (halfspaces, central spaces, opposite wing). Local combinations can be used in other areas of the pitch as well and if players are confident playing in tighter spaces, it can cause a real headache for the opponent trying to keep the attacking team away from the centre. Against Bournemouth, Manchester United sought to use local combinations on the left wing between Shaw, Martial and sometimes an additional player to penetrate down the wing. As mentioned before, the effectiveness of using local combinations along with other ways United attack largely come down to the individual quality of the players involved. Shaw makes a simple pass to Martial while Martial tries to use his qualitative superiority through dribbling to unsettle Bournemouth and get into the box. Martial gets to the byline and crosses to Zlatan, but the Swede is unable to handle the cross and another chance to score goes to waste. Both players could have executed better but fundamentally, it shows the lack of killer instinct at home that’s plagued United in previous home draws. An effective tool in destabilising opponents, passing between the lines, especially into central spaces and maintaining possession in these areas can help to unsettle the opponent. It’s a strategy United don’t use often when the opponent has restricted space in central areas, but is one way United more easily progress up the pitch versus circulating the ball wide and trying to penetrate through the wings. Against Bournemouth, Carrick seemed to be the only player looking for this type of pass. Other players either passed laterally or to the wings or played balls over the top. Diagonal passes between the lines into central spaces or even the halfspaces can cause a slightly diagonal, but mostly vertical shift for the defence seeking to recover shape and keeping the attacking team away from the centre. It opens up some possibilities to play in between the spaces where the opponent or defending team is seeking to shift into which can further destabilise the defence. Hence, why Carrick’s pass to Rooney above allows United to more easily progress up the pitch and leads to a shot on goal for Martial. Final strategy United use to break down teams is balls over the top. Mostly Pogba uses this strategy as his vision and execution can help unlock defences from deep. Among the top 5 European leagues, Pogba has the 2nd most through balls this season (12), behind Lionel Messi (14), tied with Kevin de Bruyne (12) and ahead of Marco Verratti (11). Late in the first half, Pogba somehow finds Rooney among a crowd of players, leaving Rooney with a chance to regain the lead but Boruc is equal to Rooney’s effort and it goes out for a corner. Since Manchester United’s attacking system is more flexible and free form compared to Louis van Gaal’s time at United, there are some inherent issues which come with this approach. In a more flexible, personnel-based system, unless the personnel involved organically look to account for the gaps or lack of options in a given attacking sequence, those gaps or lack of options are not addressed. They become the weak points of the attack and can slow down the rhythm. Even before Bournemouth went down to ten men, as the half wore on, United began running into these issues. It lends to disjointed attacking structures which can make it difficult for players to know what to do next or figure out how to best rectify the disjointed situation. There were many instances throughout the first half where Manchester United’s attacks slowed to a halt due to lack of options for the ball carrier or receiver. It’s easy for fans to blame the player on the ball or about to receive the ball for not doing more with it. However, if there’s a lack of options around them and dribbling past opponents is not their strong suit, what exactly are we as fans expecting them to do? 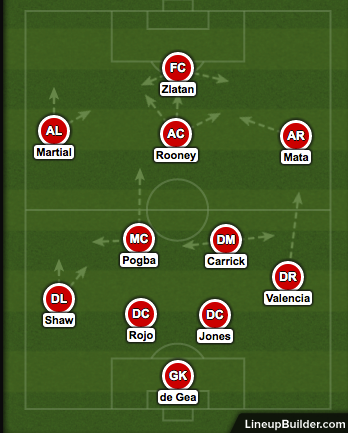 Due to Rooney’s starting position, when Valencia looks up, there is no passing option forward but only back to Pogba. At this point, the attacking rhythm has slowed and United look to circulate the ball in hopes of finding another way to break down Bournemouth’s defence. The yellow markings indicate where Rooney could be and the possible connections and options that would arise from it. Assuming Valencia plays the ball to Pogba at this moment and Rooney is positioned at the yellow X, it’s easier for Pogba to reach him with a one-touch pass. If Rooney receives the ball at the yellow X, provided there’s enough time and space, he can pick out Mata, Martial or Shaw and cause a shift in Bournemouth’s defence and potentially open more spaces to destabilise Bournemouth’s defensive organisation. Now with Pogba as the ball carrier and Bournemouth shifting to the right, it cuts out the passing option to Rooney even though the still image hints Pogba can make a pass to Rooney. Before Pogba received the ball, Carrick could have moved more vertically toward the 10 space (where player in #10 position/role usually positioned) to be a more optimal passing option for Pogba, but unfortunately, at this moment it’s too late as Pogba prepares to pass back. While Bournemouth’s defensive structure is fairly sound here, this situation is more about United shooting itself in the foot with disjointed attacking structures more than Bournemouth’s resolute defending. As King tightly marks Carrick, Arter and Afobe press Rojo from both sides. 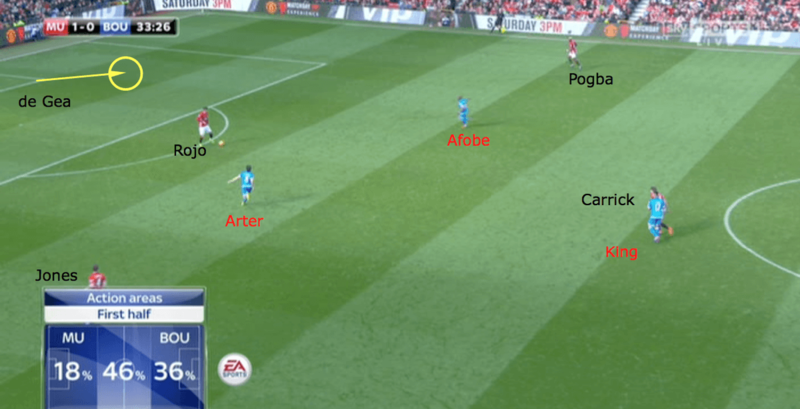 Already, it can be seen Rojo is isolated relative to his teammates and due to Arter’s and Afobe’s closing speeds, Rojo has only so much time to react. Before Jones makes the pass to Rojo, Carrick is too slow to break away from King’s marking to support Rojo. He tries to make up for it when he recognises Rojo will soon be under pressure but it’s too late. After making the pass, Jones could have recognised Arter continuing his run to press Rojo and checked back more rapidly into space to provide an outlet for Rojo. Instead, Jones watched the play unfold. Yellow circle denotes a possible option for David de Gea to be positioned to support Rojo. Due to Afobe’s closing speed, Pogba at this moment is behind the play thus less likely to support Rojo. Upon receiving the ball, Rojo’s body position is quite straightforward. If he positioned his body more diagonally and tailored towards his strong side, it would have opened up the possibility of more easily finding Pogba with a one touch pass or turning and playing back to de Gea. However due to Rojo’s original body position, he took more touches than necessary meaning less time and space to make a more strategic decision (decision which benefits the team). Overall, United responded too slowly to Bournemouth’s pressing actions, thus Rojo felt best decision to go long. A final example demonstrating how United at times struggled to progress up the pitch due to lack of options. In these type of moments, players tend to spend more time on the ball than moving it and maintaining the initial rhythm of the attacking sequence or speeding it up. The main point to understand is unless Mkhitaryan is playing (mainly in 10 position), Manchester United’s attack will tend to be splintered into more isolated subunits than experience a more steady and fluid flow. Mkhitaryan is quite a unique player in how he supports the attack because he performs multiple roles that would be performed by multiple players at other teams, especially in a more collective-based attacking system. A discussion for another day. In the second half, down to ten men, Eddie Howe’s Bournemouth came out defending in a vertically compact shape. Taking Pugh off and bringing on Dan Gosling replaced the midfield hole Surman left behind after being sent off. Vertically compact means small vertical distance between players, a useful strategy for a team down to ten men. Bournemouth had already equalised at this point. It made sense going for an approach suited to damage limitation. Furthermore, it reduced the space for Manchester United to operate in and maintained defensive support in case the ball was turned over. A big change for United due to most of the Red Devils’ quality chances arising from turnovers and the open space that resulted from it. Upon winning the ball in a vertically compact structure, it is easier to evade pressure collectively due to close distances between players. Bournemouth were more expansive in the first half, thus could not enjoy this advantage like they did in the second. It helped break down moments where Manchester United attempted to win the ball back via passive pressing and allowed Bournemouth to have more control in the game despite having less possession. Despite being down to ten men, Bournemouth’s compactness helped cut out any passes into central areas. For those which did make it into central areas, Bournemouth’s player distances ensured it would be easier to push Manchester United away from the centre. 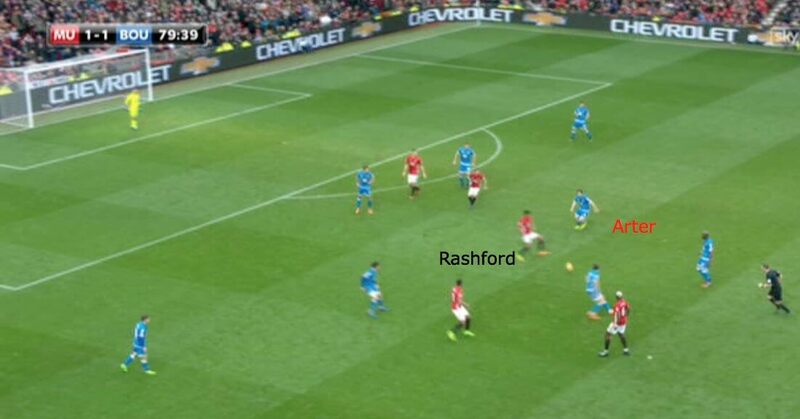 Once again, in the example below, United’s attacking structure doesn’t lend itself to handling compact spaces well and Rashford finds himself crowded out. Vertically compact structures also make it easier to set pressing traps. Bournemouth provoke Rojo into passing into Mata, making it seem like the space is open only for Arter to press and recover the ball. Gosling came in and performed relatively well. In this scene, his cover shadow (space covered behind him) restricts passing option to Rashford which helps further provoke Rojo to pass to Mata. It seems Mourinho’s intent in bringing on Rashford, Lingard and Fellaini and taking Carrick off, along with the others, was to introduce some more movement, directness and height. Rashford and Lingard struggled to get into the game and combine in the central areas they like to play and interchange in. It ultimately led to more forced passes, lack of rhythm, more chaotic build up and erratic decision making. It also meant with Carrick off the pitch, Jones got more involved in build up instead of being positioned wider. 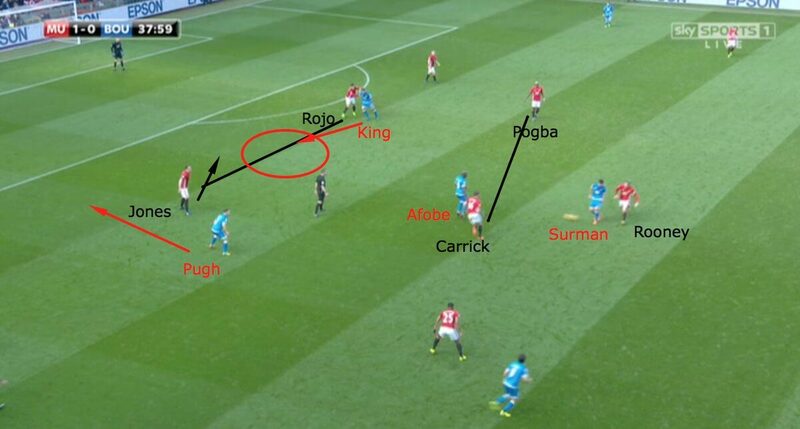 The black line indicates separation between Pogba and Fellaini and it hindered United’s build up due to the two acting quite independent of each other. While Carrick and Pogba would sometimes be positioned in this way, Carrick was more heavily involved in build up than Fellaini ever was. Thus, the burden of responsibility to help United progress up the pitch mostly fell on Pogba late on in the game. Zlatan also dropped back deeper after the substitutions to help United advance up the pitch. However, isn’t a bit strange to drop so deep when Bournemouth are already dropping deep into their own half? It further solidified the panicky nature of the game and how the players reacted to it. When performing under such circumstances and in a free form attacking system, the players have to take more responsibility and sometimes that can backfire rather than empower the team. The tweet above shows a stat called expected goals (xG) from Michael Caley’s shot maps. xG describes a statistical approximation of shot quality based on various factors. The pictures show the story of the game. In the first half, United dominated play and created high quality chances but failed to finish. In the second half, as discussed above United struggled to create against Bournemouth’s vertically compact shape. It came across as ironic because Bournemouth seemed to perform better and more confident when they decided to attack than when they had 11 men, while United performed worse. While United fans can take heart from the chances created, the poor conversion rates have been a cloud hanging over the team’s head throughout the season. It’s easy to say the Red Devils just need to finish, but creating chances is one thing, being efficient with them is an entirely different thing. Under van Gaal, United didn’t create many chances but were more effective with the ones they did create. Now, under Mourinho, United create much more chances but fail to be efficient. It’s a similar squad of players save a few, so what’s changed? Some questions which will continue to linger until Manchester United develop a killer instinct and ruthlessness in front of goal. An acknowledgment to Judah Davies @1415football and @feyre9251 for their insights!